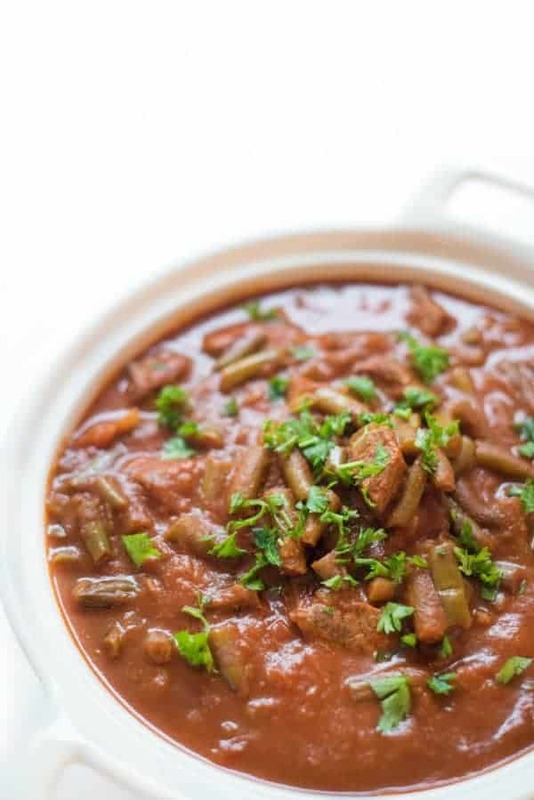 Tender beef slowly cooks with green beans, tomatoes and cinnamon to create a delicious Middle Eastern dish served traditionally over rice pilaf. As anyone with a newborn can attest, slow cookers can be a real life saver for putting dinner on the table! My little one is a 3 weeks old now and I am slowly but surely adjusting to my new life as a working mother. With a little advance planning, I’ve managed to put dinner on the table most nights of the week including today’s dish which pays homage to one of my favorite Lebanese specialties: Stewed Greens Beans and Beef (“Lubia”). This dish can also be made on the stove top if you don’t have a slow cooker. Not counting calories? Brown the onion, beef and beans in a little clarified butter. You won’t regret it. Traditionally this dish is served over Syrian rice which is rice pilaf made with rendered, clarified butter. It is a delicious special treat but also just as good with brown rice which we love making in our rice cooker. 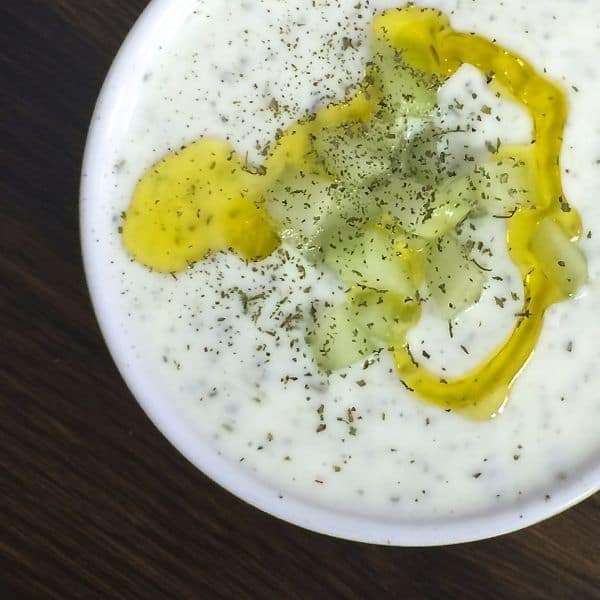 To serve, we love dolloping a little laban on top, a Lebanese cucumber yogurt garlic sauce. Your slow cooker is waiting. 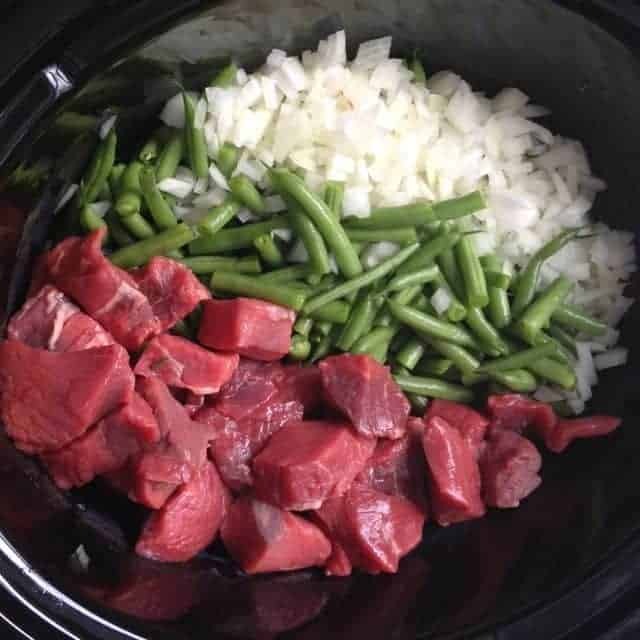 Place beef, green beans, onion and tomatoes in slow cooker. Stir in cinnamon, salt and pepper. Cook on High Heat for 4 hours or Low Heat for 8 hours. Serve over rice pilaf and a dollop of plain yogurt. Garnish with fresh parsley. Do you have an idea of how long this would need to cook in an Instant Pot/pressure cooker (not including the time needed for the pot to come up to pressure – I’m asking about the number of minutes I should input). Yes it’s a tablespoon. We grew up with it being pretty well spiced but you’re welcome to dial it down! I have been eating Lubieh for my entire life and never thought to prepare it in the slow cooker. I think my Sitto would approve! Thanks for the recipe! YES!! Makes it so easy!!!! Enjoy! 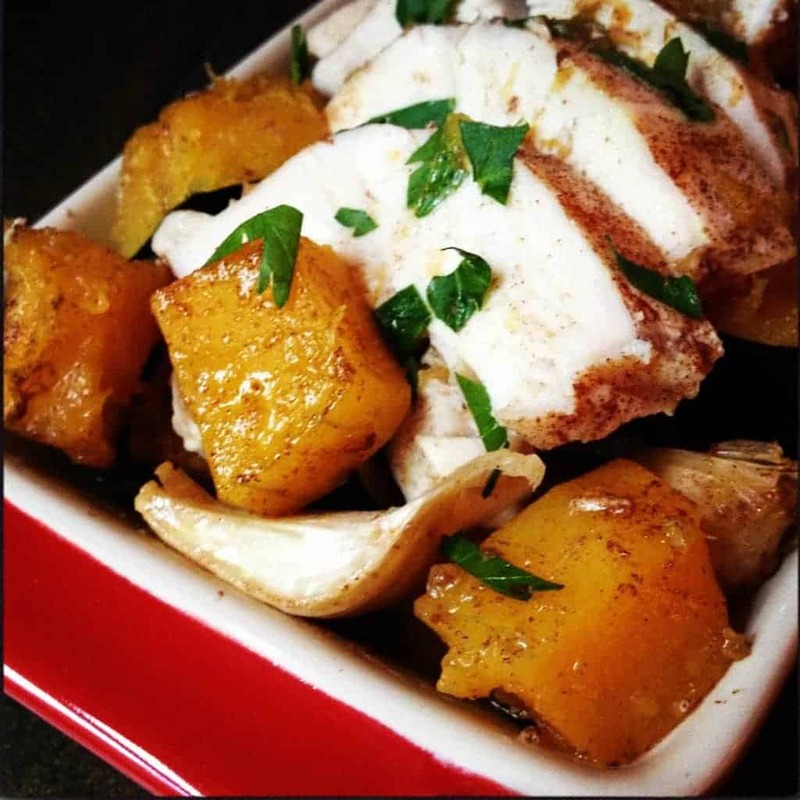 My grandfather emigrated from Lebanon in 1908, so my mother grew upon these recipes. They called this recipe Ruz Loubieh. Unfortunately my mom had all her recipes in her head and took them with her when she passed away in 1998. I am so thrilled have found your site!! I am making this one tonight!! Thank you so much!! Oh I hope you love it!!! My Armenian mother in law taught me this dish but she made it even quicker using a pressure cooker! She also substituted butternut squash for the green beans in the winter time. I make it now and it’s SO good on a cold winter night. Oh that sounds incredible Julie! My mother made this for dinner. Thank you for your receipt and stirring memories of a dish I will cook as soon as I return from the store to get the ingredients. Oh I’m so glad Joe!! I hope you enjoy it! Liz, I’ve made a variation of this dish with either lamb, beef chuck or, as I’m currently doing, diced up raw chicken thighs. Also, my spicing may not be authentic but includes a bay leaf, fresh lemon zest & juice as well as typical garlic,cumin and cinnamon. I think the dish is best with fresh green beans added late in the stove top simmer. I’ll admit this version is fussier but worth it if you have the time.As with most slow braises, it’s even better next day. That sounds so incredible!!! I love the bay leaf idea. We do use fresh beans a lot in the summer but this is a nice short cut so that we can get our fix on a more regular basis. 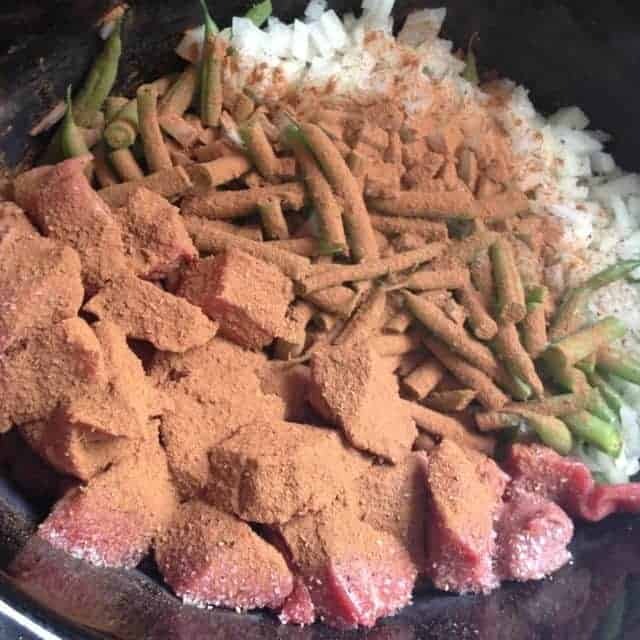 How much lemon, garlic, cumin and cinnamon do you put for 1Lb beef and 1Lb green beans? Do you see the recipe at the bottom Carol? It’s 1 tablespoon of cinnamon. No lemon or cumin. Enjoy! Oh my goodness Wadih your version sounds absolutely incredible!! We made this dish last night for 30 for my sons 2nd birthday party but I’m wishing I had made your version! Thanks for writing in! I wanted to drop you a note to say how wonderful it is to see other people such as yourself making these wonderful dishes. This is a great dish…one I have eaten my entire life. Your cooking this dish in a crock pot is a new twist for me….I have never seen it made that way, however it seems very logical to do so. I will have to try it…. This is one of the products we hope to be in production with soon. I hope you try it! We didn’t grow up making it in the slow cooker but we love it. This dish is something my great grandma used to make when I was a little girl. How did you like it Lindsay?? Awesome recipe! My mom and I have been trying to remember how she used to make this staple when I was a child, this was very close to how she made it. I did double the green beans (about 2 lbs fresh beans to 1 lb meat), and a tad more seasoning since there were more beans. I also added 1 tsp allspice, and juice of 1 whole lemon. I added the lemon in the last 2 hours of cooking. This taste about how I remember as a child, my mom thinks so too! Oh I’m so thrilled to hear this!! Thanks for letting me know!! I have made this dish using oxtail, it is a richer flavored beef . Delicious! Good idea!! Glad you enjoyed! 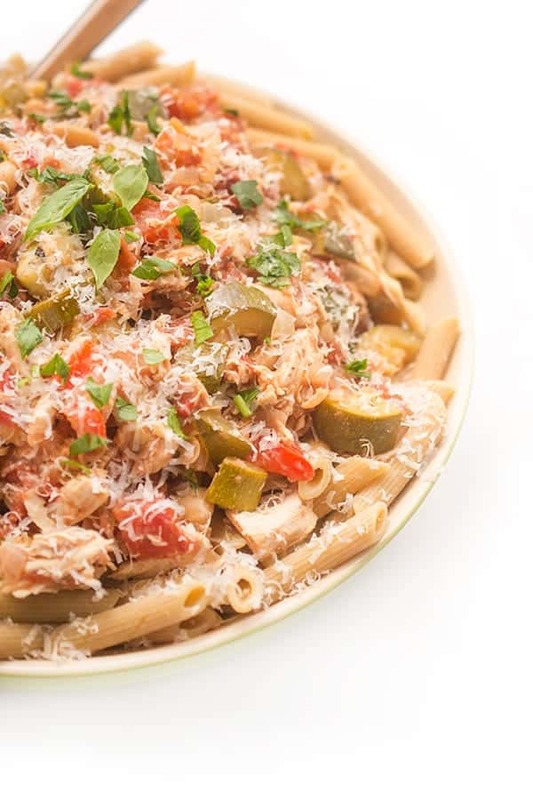 I love that you used leftovers to make this dish! Such a smart idea!! Happy Holidays! That is so cool Christine!! 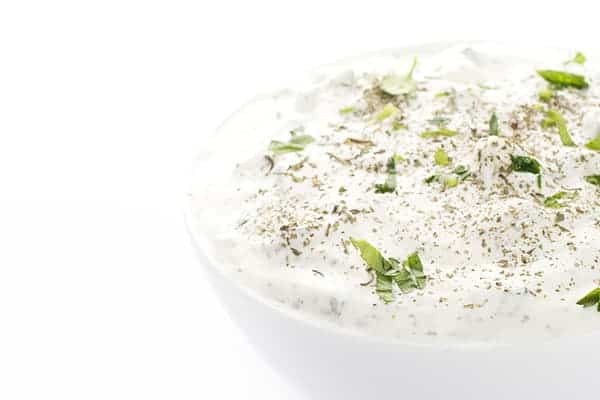 I have tons of Middle Eastern recipes – I hope you enjoy them! You can see them all here: https://thelemonbowl.com/category/middle-eastern Also I’m cracking up because my husband hates cumin but loves cinnamon/nutmeg, etc. :) Men are so finicky!! Just got a slow cooker so loving reading your recipes! I was wondering if I could use half and half Cinnamon & Cumin? You are doing a great job. we all want to eat really great clean tasty healthy food.. thanks for all the effort. Hi Audrey – Thank you so much for your sweet words! You can DEFINITELY do half cumin half cinnamon! Such an awesome idea! Let me know how it turns out ok? Oh I’m so happy to hear this!! Thank you so much for letting me know – I’m so glad your family enjoyed it. My husband requests this dish all the time!! I love this dish, but in place of beef I use Lamb. It is delish. This is a Syrian dish my mom used to make. I love lamb too Debbie although I can’t always find it as easily as beef. I’m also Syrian. :-) Small world! Thank you, Liz. I like this slow cooker recipe. I hope you enjoy it Liz! I’ve never tried cooking any Lebanese dishes, but this looks delicious! I am not a lamb eater, but the best lamb chops I’ve ever eaten were made by a Lebanese friend with just the perfect spices on top! I love lamb chops – one of my favorites!!! Let me know if you try this – ridiculously easy!! This was fantastic. I was a little shy of the amount of cinnamon, but had used some in mains in the past so went ahead and followed recipe. Awesome. Can't wait to make it again.